Last weekend, as George W Bush and the leaders of most of the world’s economies scratched their heads to find a cure for the financial plague, as raging fires engulfed multi-million dollar homes in California and as England’s rugby players were devoured by the Australians, I could have sworn I heard Eric Idle singing “Always Look On The Bright Side Of Life”. Then I blinked and sure enough, there he was, emerging from a pile of dying swans on a stage in South London. In the midst of catastrophe and doom, Eric’s chirpy little face shone through. And sitting in the audience, laughing with his subjects, was the future King of England. I don’t know if Prince Charles was looking forward to his 60th birthday: I’ve only four years to go before mine, and I’m certainly not planning any jamboree. Apart from the free buspass, it’s not the sort of milestone you usually want to celebrate. Charles has been hanging around all this time waiting for his first proper job, and there’s still no sign of it just as people his age should be thinking of retiring. His sons’ joke about them measuring up the stairs at Highgrove for a Stannah Chair Lift is probably a little too close to the mark. 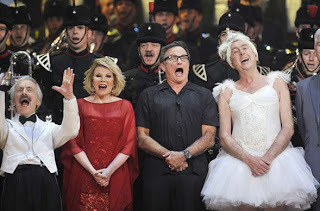 So Saturday night’s ITV show “We Are Most Amused”, in aid of the Prince’s Trust, which brought together Idle, John Cleese, Robin Williams, Rowan Atkinson, and a host of great standups, must have cheered him up no end. Cleese has a home in Montecito, California that must be covered in burning ash right now, yet he seemed pretty cheerful; so was Andrew Sachs who, despite his encounter with Russell Brand, rolled back the years as Manuel. It was a glorious romp. But what I found odd about the show was the comedy. You’d have thought that bringing together some of the world’s best comedians and recording them during a week when the world is in turmoil would lead to some pretty cutting edge stuff. Not so. It was soft and safe. Not one recession joke, no jibes at Brown. Just the usual easy targets, like Bush and Obama. Comedy usually reacts quickly to big events, but these times are so serious, even the comics don’t know how to play them. They say there’s nothing like a good laugh to raise the spirits. That and a letter telling me that my mortgage payments have just halved because of the falling bank rate. Prices are already tumbling at Tesco, the stock market is holding steady and my broker’s told me to buy shares again. The falling pound has made my business more competitive. I’ve had three offers of new credit cards in the last fortnight. Next week there’ll be tax cuts for all. But will I be off to the shops? I very much doubt it. There’s the problem in a nutshell. The national mood is currently so black, we’ll be banking the lot, or more likely stuffing it under our mattresses. A friend of mine at a television network has told me that advertising spend is down by half. Millions of cars are sitting unsold in forecourts and yet, however much they drop the price or give us free credit, we’re not tempted. House prices have already fallen, but noone’s buying. This recession is not a statistic, it’s a national state of mind. Right now an insidious fear has spread throughout the developed world. It started as a corporate collapse, now it’s a crisis of confidence. There’s a danger that all Brown’s tax breaks will simply fill Britain’s piggy banks. In my view there’s one solution to this: we need a right royal party. Or perhaps a coronation. Now that would lighten the mood.